It is our joy to share with you that Bishop Marcus Matthews has appointed the Reverend Mamie Alethia Williams as the new pastor of our congregation. 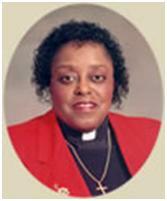 Pastor Williams will begin her responsibilities here at Trinity on July 1, 2014. As a United Methodist Church we are part of an appointment system. Our congregation’s staff parish committee has met with the district superintendent and has also met with Pastor Williams to begin to prepare for the transition and to ask questions. Pastor Williams brings a wealth of life and pastoral experience. She is an elder who has served as pastor of several churches in the Baltimore and Washington area, including Calvary UMC (DC), Centennial/Caroline Street UMC (Baltimore), and Hughes Memorial UMC (DC). Pastor Williams has also served as District Superintendent of the Annapolis District of the Baltimore-Washington Conference and was a member of Bishop Felton Edwin May’s cabinet. She currently serves as pastor of the John Wesley UMC in Glen Burnie, MD. She told us she is looking forward to joining Trinity this summer. If you have any questions about the upcoming pastoral transition, please send them to the staff parish relations committee. Mamie Alethia Williams was born and reared in Sumter, South Carolina. She was baptized in New Bethel Baptist Church at twelve years of age. Two years later, she joined the Emmanuel United Methodist Church where she participated in the organized youth ministry program led by her ninth grade history teacher. She experienced good youth leadership and mentoring. It was at Emmanuel that she responded to her call to ministry and began moving in that direction. She attended Claflin University in Orangeburg, South Carolina and was graduated in May, 1972. She then enrolled in the Interdenominational Theological Center (ITC) in Atlanta, GA. She matriculated there until her transfer to Wesley Theological Seminary in 1975, graduating in 1978 with a Master of Divinity Degree in 1978. During these three years she was ordained a deacon and served as student pastor at Calvary United Methodist Church in Northwest Washington, DC. She served this multicultural congregation and community from 1977-1982. Calvary opened the first multicultural bi-lingual day care center in the 14th Street corridor in the District of Columbia. In 1982, Pastor Williams moved to Centennial UMC in the east Baltimore City. She served this historic African American church and community for three years. In 1984, the Centennial /Caroline Charge was established. She merged Centennial with historic bi-racial Caroline Street United Methodist Church in 1985, and after the bills of Caroline Street were paid, some needed structural repairs were made to Centennial with proceeds from the sale. Because Centennial was established on the same date of Lovely Lane UMC in 1772, the new church was named Centennial-Caroline Street UMC. In 1988, Pastor Williams was appointed to Hughes Memorial United Methodist Church in far Northeast DC. She assisted them in the building of a new facility that houses a fellowship hall, offices and classrooms. She was with that congregation for ten years. Pastors and the congregation continue to invite her to return for significant events. In July 1998, Bishop Felton E. May appointed Pastor Williams to his cabinet. She served the Annapolis District for seven years. During these years, Pastor Williams was very active in the community. She is well known to legislative and community leaders in the state and Anne Arundel County. Beginning in 2005, Pastor Williams as appointed as Executive Director of the Northeastern Jurisdiction Multi-Ethnic Center. In 2007, Pastor Williams was appointed to Fowler United Methodist Church in Annapolis. During this part-time appointment, Pastor Williams taught a course at the Anne Arundel County Community College. On July 1, 2009, Pastor Williams was appointed to John Wesley United Methodist Church in Glen Burnie, Maryland. Throughout her ministry, Pastor Williams as taught in mission schools and in other settings while serving the needs of the congregation. She has a very humble spirit and made the “Golden Rule” her philosophy of life in the fifth grade. She continues to adhere to this philosophy of life to order her days.